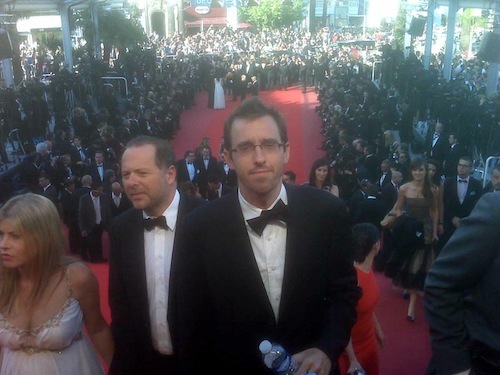 I know before I ever went to Cannes, I thought it was just a film festival with big names, yachts, and riviera weather. How I understand that part of it now is obviously a little more clear. To put it simply, the festival itself of the stars, yachts, and Riviera is actually one big advertisement for something far more important: the Cannes film festival is the place where future movies are put together and where already made movies are sold. The festival hype (or advertisement) is what brings everybody in the industry together keep making movies. On this last excursion my producer (Darren Goldberg – Atlantic Pictures) and I were working form day to night. One meeting to another then one party to another (which were actually follow-ups to the day meetings though I can understand how one may think this is not the case…but it is). Nevertheless, amongst all the moving and shaking Darren and I were able to get to one film which we figured if we gonna carve out some time to see a movie, we might as well do it in a tux. In retrospect, it’s fun to say we did it but I can tell you this, watching a film in a tuxedo is hardly luxurious.